The sharing economy is rapidly becoming prevalent and popular in today’s society. This ecosystem makes the American dream of owning and operating your own business and working for oneself, easily accessible to the masses. The sharing economy is becoming more and more commonplace in our lives, most notably: Uber (Ridesharing), Airbnb (Property Rental), and Twitch (Live Video Streaming) to name a few. The Sharing Economy is truly in its infancy in the United States and has seen rapid growth in other countries around to world for many years with an expected value of $335 billion by 2025. The sharing economy has established players and products in many different industries, ranging from transportation, property rentals, video content, food delivery, and more. Interestingly enough, there isn’t a major established player when it comes to e-commerce and the sharing economy. While some e-commerce platforms such as Shopify and Etsy have trace elements of these sharing philosophies, they’ve barely scratched the surface of the full potential of what e-commerce can become. The online marketplace is controlled by a very small handful of players and while these platforms have made shopping more convenient, they have also made it difficult for small businesses to compete online. There are no simple solutions in the e-commerce space that leverage the sharing economy in a way that incentivizes business growth, all while leveling the playing field on large distributors. Today’s online shopping experience requires users to go to dozens of portals to buy the inventory that they desire. While some companies combine hotels, airfare, car rental all in one place, there is nothing on the market that allows for the consumer to benefit from these sales, nor a place to buy anything outside of the category they are shopping in under one roof. Finding tangible goods, services, bookings, digital content, ticketing and more within a single platform that can be controlled by anyone, just doesn’t exist. At ECXTECH, we are building an online marketplace built on the sharing economy that is truly open – a platform where anyone can compete and find virtually anything in one place. Lavell, formally known as Condotto, simply put, is “Uberizing Online Shopping.” It is the next evolutionary step in the world’s e-commerce ecosystem. No different than UBER’s ride-sharing concept, Lavell looks to leverage the sharing economy to redefine how people buy and sell online. Lavell enables inventory owners and sellers to work together to introduce a new competitive and streamlined consumer experience. Lavell is a revolutionary software platform, that allows anyone to sell more product, faster to a wider audience than ever before. Using its patent-pending shared inventory technology, Lavell lowers the barriers of entry for anyone to create their own e-commerce business, thus creating a new sharing economy model for both inventory owners and sellers. This powerful system exposes any markets’ inventory to the public for sale, in potentially thousands of commissioned seller’s online stores, all over the world. In turn, increasing the audience exposure and likelihood in which something is sold, all while limiting arbitrarily marked up prices for consumers. Inventory Owners: Do you have something to sell? Step 1. Cataloging items: The owner of any item will fill out a form on the Lavell marketplace. Using various information, such as images, descriptions, prices, commissions percentages, etc. about their item. Once cataloged, this item will then be added to the shared inventory system(SIS). Step 2. Shared listings: Next, Lavell’s unique platform allows any item in the shared inventory system, to be listed for sale by an infinite number of Lavell storefronts in tandem. The platform then alerts the owner that their item has been accepted for listing by other commissioned sellers’ stores. Step 3. Transaction and Fulfilment: When the item is sold through a storefront, Lavell’s payment system automatically distributes the funds to all parties. All stores that list these items will have their quantity decremented simultaneously in real-time. The item is then fulfilled by the inventory owner or fulfilment partner. The biggest difference between other platforms and Lavell is the sharing economy culture. What this means is that any item listed on the platform can be sold by any storefront for a commission. Since commissions are set by these inventory owners, other commissioned sellers are incentivized to list and market these items in their own virtual stores. Those commission prices are easily absorbed by the inventory owner as a small percentage of their margin. Lavell focuses on making sure that inventory owners always own their customer data, unlike other e-commerce platforms. In typical e-commerce ecosystems, items sold contain markups in an effort to create margins for the merchants. On Lavell, the price is fixed by the owner and the merchant can’t change the price, unless they own the item being sold. Commissioned Sellers: Are you looking to start your own business? Step 1. Open a Virtual Storefront: Anyone can create their own e-commerce business by opening their own free virtual store and become a commissioned seller. To start, sellers will use Lavell’s storefront creator to build a brand around the type of items that they want to sell. They can then customize relevant information about their brand for their audience to see, such as logos, descriptions, social networks, videos, etc. Coupled with a Lavell merchant account, each individual store creates the added benefit of earning passive income seamlessly. Step 2. Search the Shared Inventory System: Next, sellers can browse potentially millions of publicly listed items in Lavell’s shared inventory system. Sellers can select items to add to their storefront as it relates to their brand. Selecting higher commissioned items will yield greater returns for the storefront owner. Step 3. Audience Reach: Store owners can use Lavell social media integrations to leverage any existing social media followings (ie Twitter, Facebook, Instagram, Twitch, etc.). Their storefront link exposes items listed to their social following, therefore reaching a larger audience for the inventory owner and greatly increasing the likelihood of a sale for the item listed. Step 4. Transaction: When the item is sold by a commissioned seller, Lavell’s payment system automatically distributes funds to all parties. All stores that list these item quantities will be decremented simultaneously in real-time. One of the benefits of being a commissioned seller is that they will never need to store, manage, or fulfill the items sold. Distribution is the responsibility of the inventory owner. Lavell’s sharing economy also serves as a replacement for large distribution channels such as Amazon to move product. By leveraging anyone’s time and social audience as an asset, these individuals can sell any product for a commission on behalf of the owner of the item. Inherently, Lavell storefront owners become “salespeople” for all inventory owners on the platform. The beauty of Lavell’s patent-pending system is when items are listed by an owner, they can also be added to as many commissioned storefronts as they like. With this new salesforce, inventory owners increase exposure of the item listed for sale, to reach a larger audience. Consumers: Are you looking for something to buy? Step 1. Search: Users can search for the items that they wish to buy, with the added benefit of tangible goods, virtual inventory, and services, all in one place. Step 2. Buy Item: The buyer then simply purchases the items and are shipped to them from the inventory owners or fulfillment partner. A broader range of inventory items not typically found under one roof. Prices aren’t inflated because sellers are incentivized by commissions and can’t mark prices up. Consumers can more easily “vote with their dollar” by buying items from the desired inventory owners and commissioned sellers, they wish to support. Lavell’s AI system prompts the user with relevant storefronts that contain the items that they desire. Information is based on the buyer’s habits such as purchase history, and more, help locate the items that are more relevant to them. Lavell is redefining what “one-stop shopping” is. Consider how you select products on Amazon. Do you typically select products “Sold by Amazon” over other no-name businesses on Amazon? 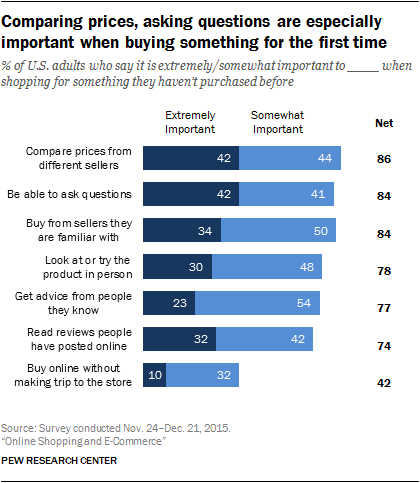 When PEW research conducted a study on levels of importance for online shoppers, they found that 86% of consumers consider the right priced item to be important. While 84% consider buying from sellers they are familiar with to be just as important. Buyers inherently want to support any number of their favorite brand influencers. Very similar to how Twitch streamers build their own communities. When a buyer is looking for an item, they will search for items they need and Lavell returns storefront listings with the items most relevant to them. With the added benefit of AI-driven output, listing certain storefronts over others. This data is based on the user’s habits and followings, which helps the balance of equal opportunity between stores. Retail e-commerce sales reached $2.3 trillion in 2017 and is projected to reach $4.8 trillion by 2021. Addressing the rapid growth over the past few years in e-commerce and the sharing economy is imperative. The world is ready for a solution that goes far beyond e-commerce as it stands today, consumer demand is pushing toward a sharing economy of the future. Lavell is that solution. Want to become a part of the e-commerce revolution? Owned & Operated By ECXTech, Inc.